What Is Marvel's Contest of Champions? Warning: minor SPOILERS for Thor: Ragnarok ahead. Marvel’s latest adventure, Thor: Ragnarok, thrusts two of its mightiest heroes into the heart of space when Thor (Chris Hemsworth) and Loki (Tom Hiddleston) are banished from their own realm. Meanwhile, the Hulk (Mark Ruffalo) is already in space, having left Earth after he was possessed by Scarlet Witch in Avengers: Age of Ultron, winding up on the planet Sakaar. They become enmeshed in a series of gladiatorial competitions run by an ancient cosmic being, the Elder of the Universe known as the Grandmaster (Jeff Goldblum). Ragnarok’s comic book tie-in to “Planet Hulk” pits champion gladiator Hulk against his one-time Avengers teammate Thor in an all-out battle royale. Comic and video game fans might be familiar with the Contest of Champions. For those unfamiliar, or anyone looking for a quick refresher, we explore the fascinating history of Marvel’s first major hero-on-hero conflict. The Grandmaster whittles things down to Captain Britain, Captain America, Wolverine, Defensor, Sasquatch, Daredevil, Peregrine, She-Hulk, Talisman, the Thing, Darkstar, and Blitzkrieg. Death counters his band with Invisible Girl, Iron Man, Black Panther, Sunfire, Angel, Iron Fist, Storm, Arabian Knight, Sabra, Shamrock, Angel, Vanguard, and the Collective Man. The two teams then battle one another for supremacy. However, neither succeeds and the contest ends in a draw – albeit one slightly tilted in the Grandmaster’s favor. Death being, well, Death, doesn’t play fair. She tells the Elder the only way to bring the Collector back from her realm is to take his place, which he does (what a nice guy). It’s later revealed in Avengers Annual #16 (1987) that his sacrifice was actually a ruse. He ends up stealing Death’s powers and ensuring virtual immortality for all of the Elders of the Universe. Since then, Deadpool also partook in a bonus round of the Contest in Deadpool’s Secret Secret Wars (2015). Of course, Marvel also published two sequels, one in 1999 and another in 2015, where the Collector and the Grandmaster use the remnants of Doctor Doom’s Battleworld (still hanging out since Secret Wars) to joust for an ultra-powerful element. However, the second follow-up was also based on the popular video game released a year earlier. Nearly three decades after the classic Contest of Champions, Marvel teamed with Kabam Interactive to produce a free, mobile game marginally based on the original event. In the spirit of ‘90s classic series Marvel vs. Capcom, Contest takes a page from popular 3D-rendered 2D fighters like Super Smash Bros., Mortal Kombat X, and Injustice: Gods Among Us, allowing players a limited interaction with their environment as they scrap. Each player is a summoner, charged by the Collector to build a potent fighting force. Starting with one character, they crank up their levels by taking on quests and defeating opponents to earn experience. Once powerful enough, players can recruit other heroes and villains to their side and some heroes abilities combine to create attack or defense bonuses. They can also forge allegiances with other online combatants. After release, the character pool soon expanded to include comic stalwarts from Groot to Spider-Gwen to Kang to the Phoenix. Each brawl also takes place across familiar Marvel locales like Avengers Tower, the Astral Plane, and Sokovia. 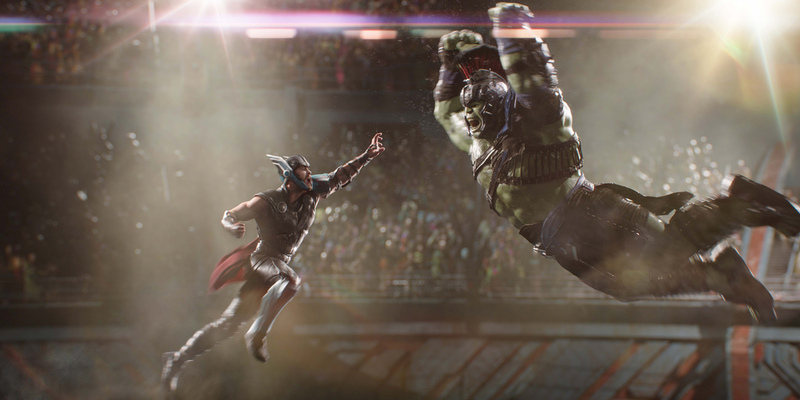 Thor: Ragnarok is influenced by numerous Marvel comic book elements, including the classic storylines “Planet Hulk” and “Ragnarok,” and is littered with Easter eggs. So, it’s no surprise that the Grandmaster puts Hulk and Thor through their paces in a contest named after the first Marvel event, Contest of Champions, and its mobile namesake. We’re totally game.